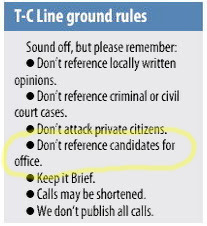 You’d think someone running for mayor, or their staff, would know at least a little something about the local paper and it’s rules for letters and TC-Line phone calls. I’ll go ahead and educate them: this is from the Times-Call’s website, which is also in every paper every day. So, which is it? Were they ignorant of the rules, or want you to call in anyway? Remember, the group of people supporting Mr. Coombs had no love for the Times-Call until a major newspaper conglomerate bought them out. Who needs local papers anyway, right? So now they have their Denver Post/Boulder Camera clone, and still can’t get it right. This mayoral race between Mr. Coombs and incumbent Bryan Baum really shouldn’t even be close. Mr. Coombs is guaranteed 30%-35% of the local ignorati, you know, the losers who attack family members and friends of Mayor Baum, real trash acts. Don’t waste your vote on their candidate, because that’s exactly what you’d be doing. Tagged Bryan Baum, Dennis Coombs, Karen Benker, Longmont, Richard Juday. Bookmark the permalink. Chris, your ignorance, ego, and outright stupidity continue to amaze me. The above comment came from IP 24.8.33.44. If one looks that up it goes to Longmont Area Dems. Looks like they used an iPhone. No doubt still smarting from the whupping they got at last night’s reapportionment mtg.